With the decrease in the activities of forest robbers and poachers in the Sundarbans, experts and Forest Department officials expect an increase in the number of tigers in the world’s largest mangrove forest. They think the tigers of the Sundarbans, the world’s largest abode of the big majestic cat, are now well-protected and their movement is safe as the activities of forest robbers and poachers have decreased to a large extent following smart patrolling in the forest. As the Sundarbans tigers survive combating various natural disasters, there is no chance of their disappearance from the mangrove forest even if all the tigers get extinct from the rest of the world, said a wildlife expert. According to sources, the number of tigers in the world's forests has dwindled to only 4,000 from 1 lakh over the last 100 years. Three sub-species of tiger out of total eight have already become extinct from the world. Striped big cats used to be found in 13 countries even one year ago but the number of the countries has now stood at 12 with the majestic cat going out of existence. The tiger is categorised as the critically endangered species due to deforestation, piracy and poaching worldwide. As part of the government’s efforts to engage people around the Sundarbans, a Unesco World Heritage Site, in protecting the tigers, the 'Tiger Day' is being observed nationally outside Dhaka for the last two years. This year, the ‘Tiger Day’ will be observed on Sunday (July 29). This day will be observed in Khulna nationally after Bagerhat district. The theme of this year’s day is: ‘Save the tiger, save the forest, protect the Sundarbans’. According to Forest Department officials, tigers are being surveyed in the Sundarbans through 'camera trapping' for the second time. In 2017-2018, the images of tigers were captured installing cameras in different places under four ranges of the Sundarbans. Now, the work to analyse the captured images is underway. According to the survey conducted in the Sundarbans through the ‘camera trapping' in 2013-2015, the number of tigers in the Bangladesh part of the Sundarbans is 106. In the Sunbarbans, every tiger, known as flagship species of the forest, identifies a 14-16 sqkm area as its home range for living and tigers roam almost throughout the forest. Forest officials said the activities of bandits and poachers have seen a decline in recent times following the introduction of smart patrolling which has ensured the safe movement of the tigers. However, the tigers have to face different climate-related phenomena like salinity, storm-tidal surge and river waves, they said. For this, tigers sometimes invade locality. On January 23 last, a tiger, which entered Gulishakhali village in Morelganjupazila, was beaten to death by locals. Md Amir HossainChowdhury, forest conservator of Khulna region, said the forest robbers have started returning to normal life following regular drives of the Forest Department and law enforcement agencies. “As a result, the tiger is much safer in the Sundarbans now. No tiger was killed by any poacher in the Sundarbans in the last two years,” he said. For the second time, the images of tigers have been captured through the ‘camera trapping’ method, he said. “Now, the analysis work is underway. On completion of the analysis, the number of tigers could be known,” he said. 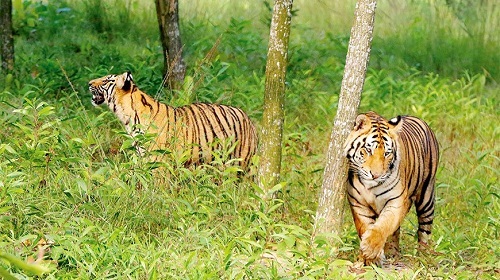 Prof MdAnwarul Islam, WildTeam chief executive and a teacher of Zoology department at Dhaka University, said if all the tigers are lost from the rest of the world, there is a least chance that they become extinct from the Sundarbans. “The Sundarbans won’t survive if the tigers don’t survive,” he said. He, however, underscored the need for ensuring food for tigers in the mangrove forest for their survival. The wildlife expert called for protecting deer in the Sundarbans and reducing the movement of people in it, suggesting building a forest-centric information centre for tourists. Dr Anwar said an adult tiger generally gives birth to 3-4 cubs a year. “If these tiger cubs can be protected, the number of tigers in the Sundarbans will be increased,” he said, underlining the need for involving all to protect the majestic big cat. He said they installed cameras in every 5 sqkm during the first survey and they took images of tigers this time installing cameras in every 2 sqkm. AsaduzzamanMilon, former president of Sundarbans Management Committee and chairman of Rayanda union parishad in Sharankholaupazila, said several gangs of tiger poachers were active in several villages surrounding the Sunbarbans. “However, there’s no activity of the gangs right now,” he said. He said people are now much aware about the conservation of forest resources which led an end to the killing of tigers.